A “rest-day” today, camping here on a grass plain by a wide crystal-clear river, mountains in the far distance, with pasta on the bubble for lunch. However, for some, it’s anything but rest. As Betty Banham said, it’s better described as frenzied activity as it’s a chance to get cars fixed for the final two days of Mongolia. Broken engine mountings, snapped shock-absorber mountings, radiator mountings, the job list for the sweep-mechanics has gone on and on, with some cars going off into town to visit a welding shop for repairs to cracked chassis, and more. Car 59, the Alvis of Rudi Freidrichs and Lennox McNeeley, was looked like a dragon-fly without its wings once its wheels were off and various bits stripped out on the grass. This car had set second best times on the Time Trials coming into here, and the story is now emerging of the car achieving this after a make-shift repair to a broken king-pin. The Wilkinson’s supplied a spare they were carrying, but it was a size too small, so a sardine car was cut up to make a shim, and the whole lot put back together again, good enough to set a second-best time. Mending and making-do out of bits and pieces has been going on all day. The Volvo PV544 of Nicholas Pryor and Lesley Stockwell has had major surgery to its rear end, with shockabsorber mountings re-made, an engine mounting made, and the eyelet mounting of Bilstein shocks strengthened with added welding. Robert Kitchen in one of the sweeper-trucks has attended to various electrical problems. There are river crossings ahead, and good water-proofing will be vital. The 1954 Sunbeam Talbot Alpine of David and Joanna Roberts is in town having a cracked chassis welded up. They are not short of company. 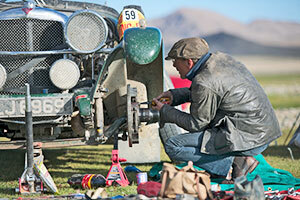 Car 28, the Lagonda with Dutch crew Maarten Hoeben and Jan Bruintjes, have put their open two seater on the back of a truck for a long haul to the Russian border, having suffered a broken axle half-shaft. For those not attending to repairs, the locals have put on an afternoon display of archery, wrestling, and horse-riding, culminating in archery on the back of horses at full gallop. The sun dropped quickly over the far mountains, to be replaced by a full moon tonight… it’s been a bright blue sky all day which suggests tonight could be a cold one.